^ Emshwiller, E. (2006). "Origins of polyploid crops: The example of the octaploid tuber crop Oxalis tuberosa". In Zeder, M. A.; Decker-Walters, D.; Emshwiller, E.; Bradley, D.; Smith, B. D. Documenting Domestication: New Genetic and Archaeological Paradigms. Berkeley, CA: University of California Press. pp. 153–168. ^ Ma, L.-J. ; Ibrahim, A. S.; Skory, C.; Grabherr, M. G.; Burger, G.; Butler, M.; Elias, M.; Idnurm, A.; Lang, B. F.; Sone, T.; Abe, A.; Calvo, S. E.; Corrochano, L. M.; Engels, R.; Fu, J.; Hansberg, W.; Kim, J.-M.; Kodira, C. D.; Koehrsen, M. J.; Liu, B.; Miranda Saavedra, D.; O'Leary, S.; Ortiz Castellanos, L.; Poulter, R.; Rodríguez Romero, J.; Ruiz Herrera, J.; Shen, Y.-Q. ; Zeng, Q.; Galagan, J.; Birren, B. W. (2009). Madhani, H. D., ed. "Genomic Analysis of the Basal Lineage Fungus Rhizopus oryzae Reveals a Whole-Genome Duplication". PLoS Genetics. 5 (7): e1000549. doi:10.1371/journal.pgen.1000549. PMC 2699053. PMID 19578406. ^ Lidzbarsky, G. A.; Shkolnik, T.; Nevo, E. (2009). Idnurm, A., ed. "Adaptive Response to DNA-Damaging Agents in Natural Saccharomyces cerevisiae Populations from "Evolution Canyon", Mt. Carmel, Israel". PLoS ONE. 4 (6): e5914. Bibcode:2009PLoSO...4.5914L. doi:10.1371/journal.pone.0005914. PMC 2690839. PMID 19526052. ^ Dwivedi, S. L.; Upadhyaya, H. D.; Stalker, H. T.; Blair, M. W.; Bertioli, D. J.; Nielen, S.; Ortiz, R. (January 2007). Janick, Jules, ed. Plant Breeding Reviews. John Wiley & Sons. pp. 179–230. doi:10.1002/9780470380130.ch3. ISBN 9780470380130. Gregory, T. R.; Mable, B. K. (2005). 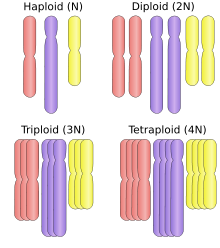 "Polyploidy in animals". In Gregory, T. R. The Evolution of the Genome. San Diego, CA: Elsevier. pp. 427–517. Tate, J. A.; Soltis, D. E.; Soltis, P. S. (2005). "Polyploidy in plants". In Gregory, T. R. The Evolution of the Genome. San Diego, CA: Elsevier. pp. 371–426. Van de Peer, Y.; Meyer, A. (2005). "Large-scale gene and ancient genome duplications". In Gregory, T. R. The Evolution of the Genome. San Diego, CA: Elsevier. pp. 329–368.